These days, I am wearing two different artistic hats: glass artist and sculptor. 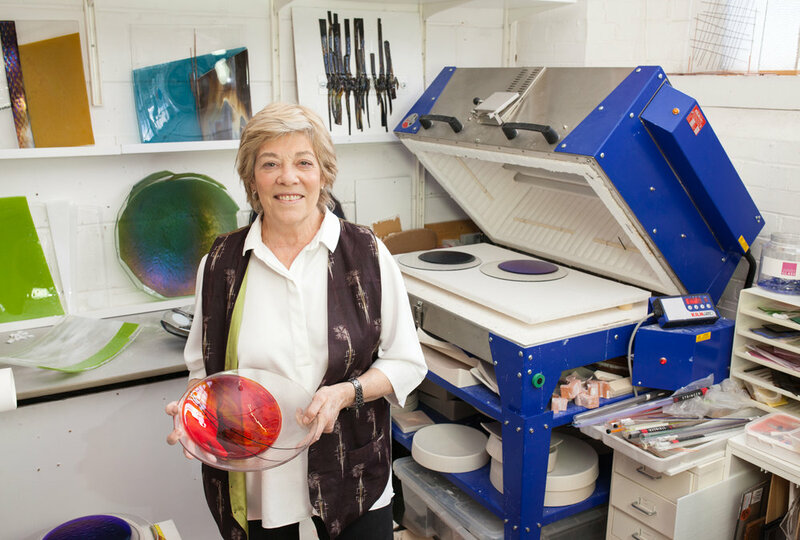 In my glass studio I create a range of work that includes tableware, sculpture, lighting and large decorative statement pieces. Wanting to have frames and stands for my glass sculpture that are as unique as they are, I enrolled in a sculpture workshop, and now work happily with steel sheets and rods to create an expanding range of sculpture. I started working as a glass artist in 2014 after two years of adult education courses, and am still exploring this medium with great delight. I work almost exclusively with Bullseye Glass, which is imported from America (as am I.) Bullseye glass is hand rolled, and offers an incredible range of colours and finishes – transparent, opaque, iridescent, streaky. It is hard not to be seduced by that range and I have been taking advantage of the breadth of material on offer as I discover which shapes and forms and designs I most enjoy making. As befits my slightly off centre take on most things, I am determined to create works that are themselves just slightly off-centre., so some bowls will have wonky or open edges, platters might be missing a corner. Dishes that might be square will have designs that are rarely symmetrical. That makes each piece totally distinctive, which I hope will appeal to collectors as much as it does to me. These days, too many “things” are off the peg, capable of being bought over the internet because having seen one, you know exactly what the next one will be like – perhaps with only a variation in colour. I hope my pieces will appeal to those who want something different, something expressive of the maker, rather than something mass produced or formulaic. Lynn lives and works in Colchester and London, and can be visited, by appointment, at her London studio at Cockpit Arts.